With sailings available everyday from the UK, a ferry to Amsterdam is the perfect way to explore the sights and culture of the Netherlands. Ferries to Amsterdam are cheaper than you might think, and they make it easier to bring your car and pets along for the journey to Mainland Europe. There are a number of ferry providers offering sailings from the UK to Amsterdam. Below is some more information about the ferry operators, and the routes they provide between the UK and Amsterdam. DFDS provide daily sailings from Newcastle to Amsterdam. The overnight journey takes 15 hours and 30 minutes. Prices start from as little as £36 per person, including an en suite cabin and coach transfers from the port to Amsterdam city centre. You can also take your pets and car, for a small additional fee. Take a look at our DFDS Offer Codes to make extra savings on your ferry. Stena Line provide ferries from Harwich, Essex, to the Hook of Holland. Transfers from London to Harwich and Hook of Holland to Amsterdam, which allow passengers to seamlessly travel from London to Amsterdam. However, rail journeys may increase the cost of this ferry journey. P&O provide a daily service between Hull and Rotterdam. A transfer is available for passengers wishing to experience Amsterdam. The overnight ferry journey includes onboard accommodation, as well as extensive entertainment options ensuring you start your vacation as soon as you step onboard. The capital of Holland is one of the most loved destinations for UK tourists. From shopping along cobbled streets to canal tours throughout the extensive waterways, Amsterdam has activities for all types of holidaymakers, including families, groups and couples. Most ferry operators have space for vehicles, which allow visitors to explore further afield, or even begin a drive holiday in Europe. 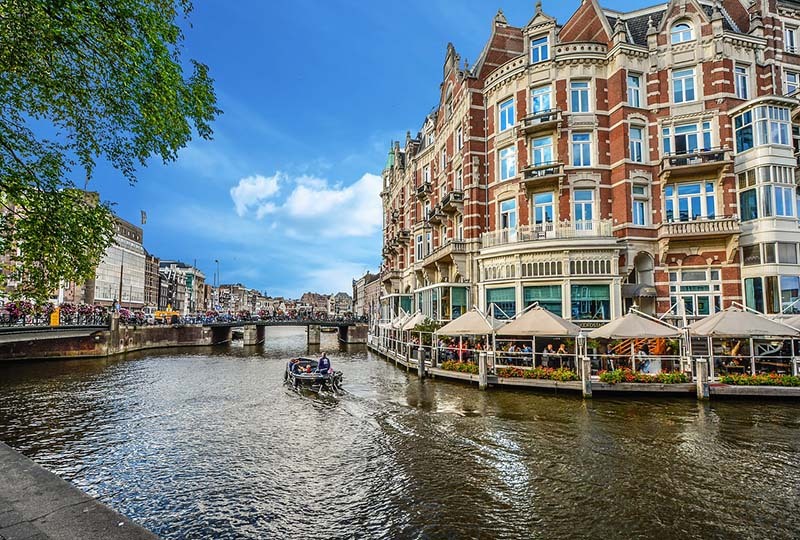 Even if you are only doing a short trip to Amsterdam, having your car will allow you to fill your boot with all of the amazing shopping Amsterdam has to offer. Bring your pets! One of the great features of a ferry crossing is the ability to bring your dogs on board. If you have a longer sailing and require a cabin, pet-friendly cabins are often available, so you and your pets can relax and enjoy the open water. How much does a ferry to Amsterdam cost? The cost of a ferry from the UK to Amsterdam starts from as little as £30, with further discounted prices available for groups. Booking early can help you save more on your tickets, and remember to avoid peak times, such as school holidays and weekends. There are a number of factors that influence the cost of your travel. Your departure city, arrival destination, whether or not you need to add transfers at each end, and much more. Your accommodation can also have a large influence on price, with both premium and budget options available. Groups bookings can cost as little as £17 per person. Most ferry operators have a specialist ‘group booking system’, or an area where you can request a bespoke quote based on the number of passengers you will have and your needs. If you are looking for more than just a simple ferry crossing, an Amsterdam Mini Cruise may be the perfect upgrade to your short break. These trips are just like a cruise, but only shorter. DFDS offer mini-cruises departing from the DFDS Newcastle port. Unlike a traditional ferry crossing, a mini cruise is a short break that includes an ensuite cabin, coach transfer connections between the arrival port and your destination city, and more scheduled sailing times. A mini cruise lasts 3 days, but you do have the opportunity to extend your stay with booked accommodation in Amsterdam. There is also a lot more to do onboard, from extensive shopping to plenty of restaurants for all tastes and budgets. You will also find cinemas, bars, games rooms and casinos onboard. If you think a mini cruise may be a better option for you, why not find out more on the DFDS Mini Cruises page. Want to know what it is like on a ferry to Amsterdam? Most of the leading ferry operators have video channels, which give you an insight into travelling onboard their vessels, as shot by real travellers. Many ferry providers only provide ferries to Amsterdam from selected ports. Most travellers will commute from the port which is most convenient for their needs, but it may be cheaper to do some research and choose a port that isn’t necessarily closest to you. Below are the available ferry routes to Amsterdam. The most direct crossing available is the Newcastle to Amsterdam ferry, as the arrival port is only a short coach ride from the Amsterdam city centre. Please Note: Some journeys do include train travel at either side of the journey. Newcastle ↔ Amsterdam – Daily service operated by DFDS seaways. Harwich (Essex) ↔ Hook of Holland (Rotterdam) – Operated by Stena Line (London to Amsterdam bookings available, with added train connections). Every travel wants to get a great deal, after all you can book another vacation with the money you save. Below are a few tips and tricks to help you save on the cost of your ferry to Amsterdam. Travel Off Peak – If you are able to travel during the week, you will generally find that ticket prices are far cheaper compared to weekend rates. Also, try to avoid travelling during school holidays, and the summer months are likely to be more expensive. Group Discounts – If you are travelling as part of a larger group, you may be eligible for a sizeable discounts. Generally, groups need to have more than 10 people, but you can receive benefits such as discounts and some in your group may get a free trip. Book in Advance – Prices are cheapest when the ferry is empty. As more passengers book, the price will often start to increase. So for the best deals, try to book early when the ferry operator is trying to fill their empty seats. Check for Discounts – Many operators provide discount codes and promotions, such as saving up to 26% with DFDS Seaways. It is always a good idea to have a quick look to see if you can save anything extra on your tickets.